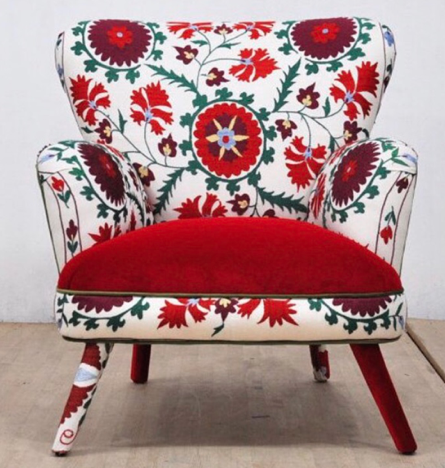 Hot to continue as a big trend in 2018 is the popularity of all things embroidered with Suzani textiles and Crewel work increasingly showing up on design blogs and pinterest pages. Suzani is a type of embroidered and decorative tribal textile made in Tajikistan, Uzbekistan, Kazakhstan and other central asian countries. Suzani itself is from the Persian word "Suzan" which means needle. The art of making such textiles in Iran is called Suzandozi (needlework). Usually with a cotton, sometimes silk, fabric base with chain, satin, and buttonhole being the primary stitches used. "Name Design Studio" is a contemporary design studio taking Suzani to new heights, creating original, contempoary hand-crafted furniture and accessories. Founded in 2010 by interior architect Jo Supara and Ali, each piece is made by hand in their Istanbul studio - are built to last with a timeless quality.